Fragrance your home with this colorful potpourri. Place in a bowl to scent any room in your home. Simply add a few drops of refresher oil every month and stir to reactivate the fragrance! • (1) Mixing Bowl (5 Qt. Measure all botanicals and place in mixing bowl. Using a spoon or gloved hands, gently mix until all ingredients are well blended. Using a measuring cup, fill each tin tie bag to 5.60 oz. by weight. Roll tin tie down and clasp bag closed. Mix all essential oils together. Fill each bottle to 0.35 oz. by weight. Any remaining product can be split evenly between the bottles. TO USE: Empty contents into bowl or jar. 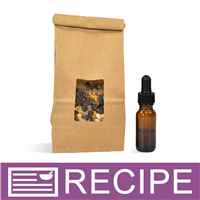 Add 1-2 droppers of essential oil blend and stir or shake to coat. Place in decorative bowl or container to fragrance desired area. 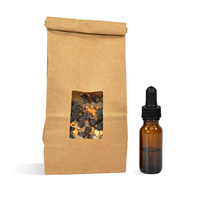 Ingredient Label: Frankincense Resin, Juniper Berries, Orange Peel, White Willow Bark, Bergamot Essential Oil, Sweet Orange Essential Oil, Cedarwood Essential Oil.